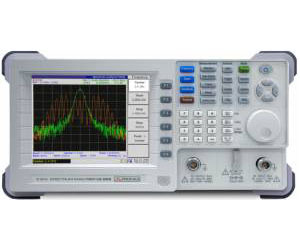 The AE-966 / AE-967 spectrum analysers cover a frequency band from 9 kHz to 3 GHz and allow stable operation in a span of 2 kHz/div to 3 GHz/div. The AE-966 is the basic model and the AE-967 includes a Tracking Generator, which turns the AE-967 into a highly useful tool for the response measurement of filters, amplifiers, attenuators or any kind of radio frequency system. The many measurement functions, such as markers, traces, power measurement, limit line, dual display, and trigger, make measuring easy and quick. Includes USB interface to connect the spectrum analyser to a printer and a flash memory, and RS-232 interface to connect to a PC. The high resolution color TFT monitor allows a clear reading of the on-screen measurements.